Packed with nutrition and flavour from organic vegetables, red lentils and quinoa. 100% Natural. At Amy’s they place high value on the quality of vegetables already long before they get to the kitchen - all the ingredients which make up this luscious soup are organically grown. Which is more when it comes to their processing and canning not a single additive or preservative is made use of. Superb taste - just like you would have cooked it at home. Imagine the nutritiousness of lentils and quinoa trimmed with the spiciness of garlic, jalapeno pepper and ginger. Now add some fresh sourness of tomatoes which keeps the kale a bit crunchy. And crown it all with the aromatic vigour of coriander and black pepper. Prevailing Vegetable Flavour. Smelling a heated portion of this soup you are likely to doubt the first point concerning its natural composition - the flavour is so intense that one may suspect some artificial assistance. The secret lies in the way they prepare their soups at Amy’s - before boiling the vegetables are gently stewed with the herbs which lets the vegetable flavour prevail over the taste of the broth. 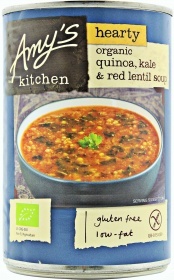 Amy’s Organic Quinoa, Kale and Red Lentil Soup - a homemade natural soup is no privilege, it’s an affordable must have. Have a question about Quinoa, Kale & Red Lentil Soup? What is it, what does it do, how and when to use or something else? Ask us. “Organic Quinoa, Kale & Red Lentil Soup 408g” is currently out of stock. Enter your details below and we will let you know when it's back in stock. Ingredients: Onion, Tomato Puree, Kale, Quinoa, Red lentils, Olive Oil, Coriander, Green onions, Garlic, Jalapeño pepper, Ginger, Turmeric (Curcuma Longa L), Black pepper, Organically grown ingredient(s).